Economic-grade acoustic guitars have always enjoyed great popularity and it is not expected that this will change. They are good to try their hand at playing, just for playing with friends and on holidays, well suited for songwriting, when you just need to have an instrument to highlight the harmony of the vocal melody being laid out. At the same time they do not burden the home budget – if the guitar adventure ends quickly, it will be easy to find another owner of such an instrument, selling it at a bargain price, or simply giving as a gift. The new Fender FA-125 dreadnought type belongs to such a group. The soundboard is made of spruce, back and sides of mahogany – all the walls of the box is obviously appropriate for this price range laminate – plywood, which guarantees solidity of the construction, which also matters when the person starting the adventure with music is just learning to celebrate the instrument and it can be easily damaged. Both edges circle black binding, which also found on the fretboard. The classic C profile neck is made of nato wood, the rosewood fingerboard has 20 frets in medium size, carefully rounded at the ends. A saddle with an angled head has a size of 43 mm. The stability of the dress is guaranteed by closed oil keys with a chrome finish in the 3 + 3 system. The top of the head covered with a palisander veneer is decorated with the Fender logo in gold. Rosewood bridge has fanciful rounding of the tips on the sides, so that the guitar instead of being another cliché instrument slightly visually comes alive. A familiar role is played by the slightly changed shape of the “tear”, meaning a black tile that protects the varnish from scratching the ankle during the expressive game. The resonance whole is decorated with a simple rosette of alternating light and dark stripes. The first inspection confirms that we are dealing with a really solidly made instrument – all the elements are well-matched, the varnish is evenly laid, all carefully polished to a high gloss. As usually with a dreadnought guitar, we have a strong sound in a wide band. The guitar sounds energetically and clearly, while playing with fingers the color is soft and velvety, striking the strings with the ankle we obtain a clear and well-aligned sound. The guitar presents a very good combination of deep bass with a nice, good-like appearance. The FA-125 sounds surprisingly well with a lighter game, which is extremely important for those who are starting their adventure with an acoustic guitar. 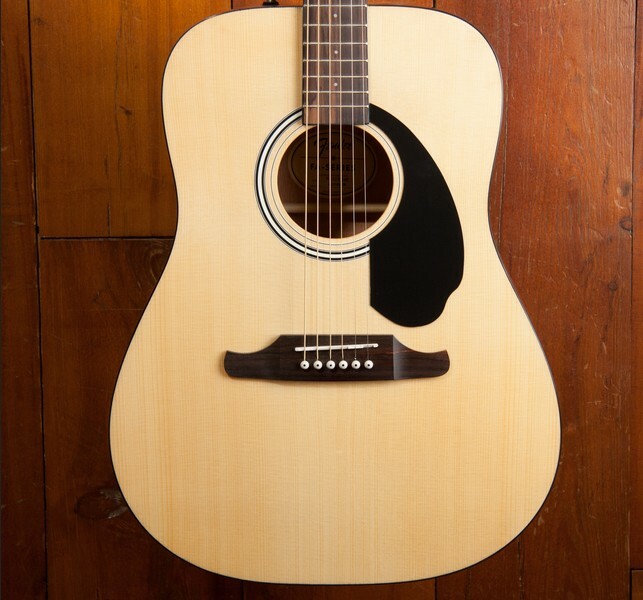 Only with a strong attack will a sharper center appear, but in this class Fender acoustics do not has too many competitors. In terms of the convenience of the game, it is also difficult to have any reservations – for those who value comfort, you can turn the neck adjustment screw to slightly lower the string action, but it is a matter of individual preferences. In short, everything here agrees and sounds really good, and that’s what it’s all about when we’re looking for an inexpensive guitar. Reliability of the Fender brand guarantees that we are dealing with a fully-fledged instrument that properly tunes and certainly will not discourage or even inspire to exercise.